We have used cloth napkins for years, since before the girl was born. I like the fact that we aren’t throwing away as much paper, and it adds a little cuteness to the table when you have cloth napkins. At least it does when you have cute cloth napkins. Some of our napkins are also older than the girl, and they’re looking pretty darn ragged. Some are stained, some have holes or are frayed at the edges. Not very appealing. I’ve long had it in my mind that I could sew some napkins out of random pieces of fabric I have lying around. It’s been on my list to do for a while, and I finally got a few made. I love this fabric. I made the girl’s crib bumpers out of it (so it’s almost as old as those old napkins) and had a random little piece of it left. Just enough, it turned out, to make five napkins, with some scrap to spare, and one napkin being a little smaller than the others. 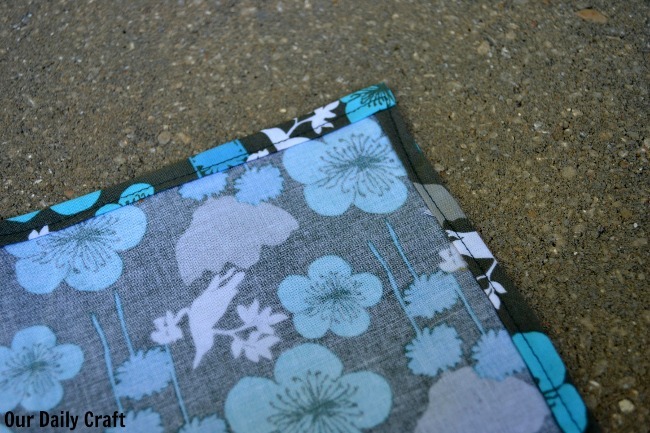 I should say right up front that while it’s easy to sew cloth napkins, it isn’t a quick project. And there is a lot of ironing involved. I only got five made because that’s all the time I could stand being at the iron on a hot day in July. But once the ironing part is done it doesn’t take much time, and the results are so adorable it just might be worth it. 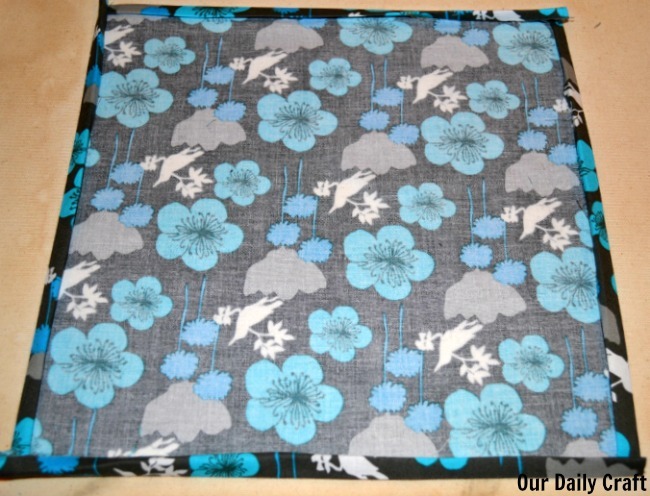 Because I used a square template, I just put my square on top of the fabric and cut around with the rotary cutter. 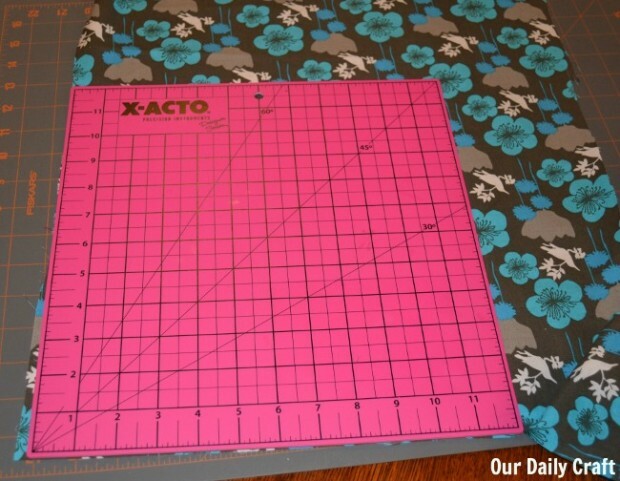 You could also mark out your dimensions if you don’t have a big square or want larger napkins and cut them out by hand. I didn’t miter my corners because these are casual, everyday napkins and, to tell you the truth, I was tired of ironing, but you can unfold the seams, trim the edges (basically cutting a triangle out of the corner) and fold back to make mitered corners if you want. Take your pile of ironed napkins to the sewing machine. I sewed mine with the back side up so I could see that I was staying on the seam. 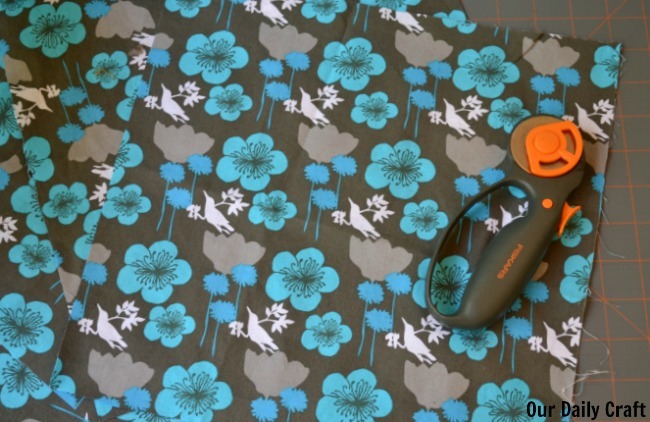 This project is great practice for sewing straight lines. I’m still working on it. Admire your adorable pile of napkins. You might want to designate a basket for them because they’re too cute for the drawer. Have you ever sewn napkins? I’d love to know if you do it a different way. I have lots of different things I want to try, so I’m sure there will be a lot more napkin patterns to come! Adding these to my list of things I need to make. I don’t do straight lines well…but I’m practicing.